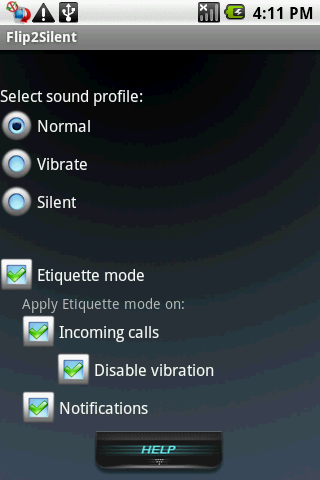 When you face your mobile down, Flip2Silent mutes ringing tone and/or phone notifications. After you face your mobile up again, Flip2Silent returns your sound profile back to its previous configuration. Flip2Silent uses Android motion sensor “Accelerometer” to detect changes in the orientation of your mobile phone handset. Flip2Silent is carefully designed to be power consumption optimized. The status of the Flip2Silent is reflected to the notification area with a special icon. Flip2Silent is available on Android market. Very nice application, I really love this application in Nokia, so it is great to have it Android. just bought the app on the market. please tell me, why the download does not start. Kindly be informed that any support requests should be sent over our contact email (available on the market) or using the contact form on our website. just installed on my new nexus one, working great. send me the way how to buy your app flip2silent, please! it works pretty on HTC desire! We are sorry for this in-convince. This problem is a common problem with some HTC Android phone users. They are not allowed to view the protected apps on the market because their mobile ROM is not approved by Google. For more information about this problem, check this thread. Any way, It is a matter of time and you will be able to see our application on the market. It seems that Android market doesn’t support purchasing apps in your country. I installed the application but does not work on my phone Galaxy S3 (Root). Is it possible to help me to launch this application.